Princeton University Press, 9780691119366, 295pp. Many people in Great Britain and the United States can recall elderly relatives who remembered long stretches of verse learned at school decades earlier, yet most of us were never required to recite in class. 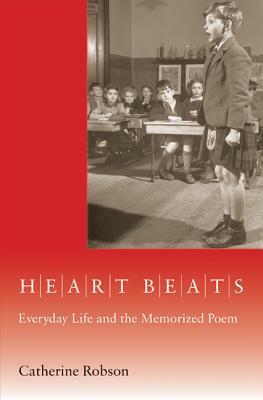 Heart Beats is the first book to examine how poetry recitation came to assume a central place in past curricular programs, and to investigate when and why the once-mandatory exercise declined. Telling the story of a lost pedagogical practice and its wide-ranging effects on two sides of the Atlantic, Catherine Robson explores how recitation altered the ordinary people who committed poems to heart, and changed the worlds in which they lived.Heart Beats begins by investigating recitation's progress within British and American public educational systems over the course of the nineteenth and twentieth centuries, and weighs the factors that influenced which poems were most frequently assigned. Robson then scrutinizes the recitational fortunes of three short works that were once classroom classics: Felicia Hemans's "Casabianca," Thomas Gray's "Elegy Written in a Country Churchyard," and Charles Wolfe's "Burial of Sir John Moore after Corunna." To conclude, the book considers W. E. Henley's "Invictus" and Rudyard Kipling's "If--," asking why the idea of the memorized poem arouses such different responses in the United States and Great Britain today.Focusing on vital connections between poems, individuals, and their communities, Heart Beats is an important study of the history and power of memorized poetry. Catherine Robson is is professor of English at New York University. She is the author of Men in Wonderland: The Lost Girlhood of the Victorian Gentleman (Princeton).